Model: The minimum radius for operation is 360 mm / 14-3/16". The underbody is specific to the car type. The trucks have brake shoes. The car has triple white headlights and dual red marker lights that change over with the direction of travel and that will work in digital operation. Maintenance-free warm white LEDs are used for the headlights. The car has a trailing switch to change the headlights / marker lights. The 7319 current-conducting couplings or the 72020/72021 current-conducting couplers, the 73406 pickup shoe, and the 73400/73401 lighting kits (2 each per car) can be installed in the car. Length over the buffers 28.2 cm / 11-1/8". First time as a "Little Mint" in 1:93.5 scale. When operated control car last, dual red marker lights shine on the cab control car. A diesel locomotive to with this car can be found in the Märklin H0 assortment under item number 37007. 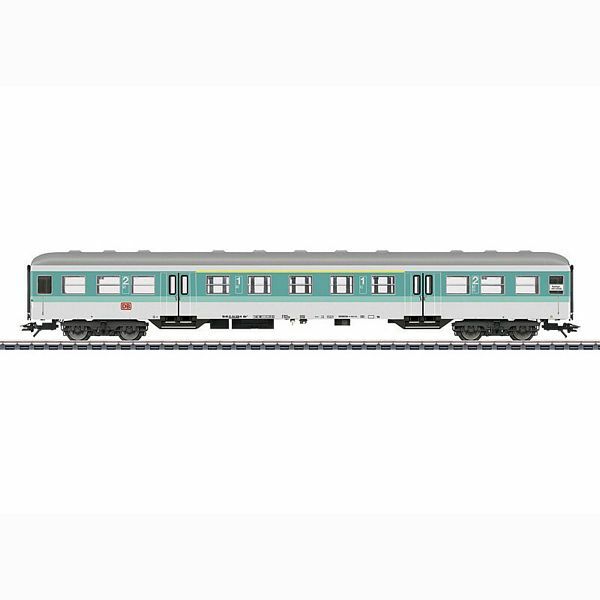 Cars to go with this car can be found in the Märklin H0 assortment under item numbers 43804 and 43814.